Serenity Contracting and Design Inc is a company that has earned a reputation in the Edmonton market strictly through referrals. Originally started as Renovation Specialists, we have quickly grown to be a Custom Home Builder and will continue to bring residential landmarks to the Edmonton housing scene for years to come. We are a company that makes a house a home. We believe that your house should be both beautiful and comfortable. Our plan is to change the face of neighborhood’s one home at a time with our primary focus on customer satisfaction through uncompromising craftsmanship and quality. The goal is to be Edmonton’s premier choice for Custom Housing and Residential Renovations. Our fundamental company values guide our passion to achieve the utmost standard and quality of the projects we are a part of. They aim to inspire our employees and captivate our clients. AG Woodcrafting was created with the desire to provide quality kitchen cabinets, kitchen design, exceptional service, professionalism and integrity in all that we do. We do not believe in putting a kitchen together without putting a face to the design. We want to know our clients and build relationships in order to provide you with the kitchen of your dreams. We will work with you or your interior designer to design cabinetry that is rustic, contemporary or traditional - we have options for everybody and every kitchen. Art Goerzen started making furniture when he was 12 years old, and it has always been one of his passions. He worked at Columbia Cabinets right out of high school, and eventually worked his way through college. He worked his way up through many divisions of the company so he was able to learn all aspects of the trade. After working at Columbia Cabinets for 12 years and living in the same community for 33 years he moved to Spruce Grove in 2000. Art enjoys spending time with his wife, Teresa, and his four daughters. He is a country boy and desires to build good relationships in his community and be a good influence. Call us today for a FREE estimate on your custom Edmonton kitchen cabinets and kitchen design project at (780) 962-6224. Welcome to the world of endless possibilities for custom cabinets, closets, wet bars, entertainment units and kitchens you've always dreamed of. Our company name reflects the quality of our workmanship. 1685 Kitchen Design Studio is a family owned and operated, fully custom woodworking shop, based in Edmonton. Through a shared a passion and commitment to high quality custom cabinetry, 1685 Kitchen Design Studio was started in 2007 by Tim and Heather Nelson. Working with all types of wood, finishing stains and lacquers, 1685 Kitchen Design Studio can create dream home spaces for any size or budget. 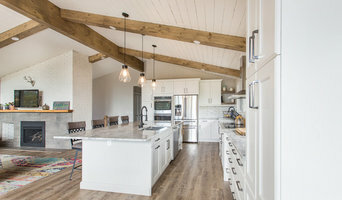 With a reputation for quality, personalized service and attention to detail, 1685 Kitchen Design Studio has become one of Edmonton's premier custom woodworking manufacturers. Our quality craftsman can meet any millwork need. 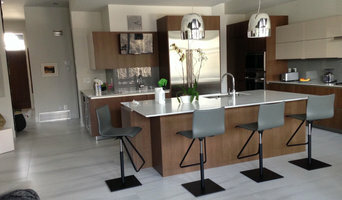 As a fully integrated custom shop, 1685 Kitchen Design Studio can make any home more functional, livable and beautiful. While our focus is on custom cabinetry, we can create almost anything in a range of quality hardwoods from cherry to maple to walnut. Call or drop by the showroom for a free consultation with our In-House Designers. Whether it's an elegant and modern twist on the traditional or a classical flourish on the contemporary, 1685 Kitchen Design Studio will partner with you for every step of production from beginning to end. Caruana Interiors & Contracting has been serving St. Albert, Edmonton, and the surrounding areas since 2007 and has a proven track record in the renovation and contracting business. We have extensive contacts and a wide network of sub-contractors to rely on, as well as a complement of full-time employees to do the bulk of work and oversee your project from start to finish. We are licensed in every city we do work in, are bonded to protect any deposits or down-payments, and are fully insured for liability. All our workers are covered by WCB. We provide personalized service, expert advice, and high quality work. We do not use "cash paid daily" labourers, nor do we sub-contract to companies that do. Competitors may be less expensive upfront, but often fall short of your expectations. We will stand behind our work, our people, and our advice until you are completely satisfied and the job is done to 110% of your expectation. Ask us for referrals and letters of reference! We specialize in turnkey renovations, allowing customers to customize anything they want, but take as much of a hands-off approach as they like. We will stand behind our work, our people, and our advice until you are completely satisfied and the job is done to 110% of your expectation. Edmonton's premier renovator for over 25 years. With a team of 25 employees your renovation project is completed with the highest of quality. Our team consists of Red Seal trades people from framing to finishing and Interior designers to assist you with your space planning and finishes. Your Cabinetry is designed and hand built right here in Edmonton in our very own millwork shop. Please watch for our fleet on the roads of our beautiful city and give us call to discuss your dream project. Why do I need a professional who specializes in kitchen and bathroom renovation and design in Edmonton, AB? 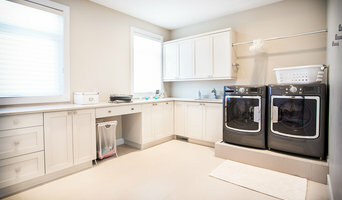 While looking for Edmonton, AB bathroom remodeling contractors or kitchen renovation experts you may often find professionals who specialize in both rooms. This is because these space have a lot in common. Kitchens and bathrooms include an abundance of fixtures that require careful planning and installation, including sinks, faucets, tubs and toilets that all need water hookups and drainage. They also use similar materials, such as tile and stone for countertops and flooring, due to the nature of their use. So it makes sense that professionals who works on the kitchen remodel and design also works on the bathroom construction or redesign. 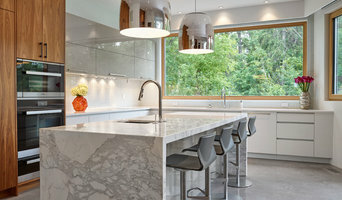 What do Edmonton, AB kitchen designers or bathroom remodel professionals do? Bathroom designers, as well as kitchen designers in Edmonton, AB, are constantly staying on top of trends in the ever-changing industry. The designers know the best layout for your room, and can configure the layout for optimal functionality and utilization of the space. In the kitchen, the refrigerator, stove, and sink should be laid out in relation to one another, and it should be seamless and easy to move from one to the other. A kitchen and bathroom designer in Edmonton, AB will know how to work with a contractor and architect to plan the flow of the room to work best for your needs. Most bath & kitchen renovations involve architectural plans from page to reality; these contractors are also trained to provide design services so that you don’t have to hire a separate pro. Like a general contractor, an Edmonton, AB kitchen and bathroom remodeling contractor is responsible for hiring and supervising subcontractors and providing materials when necessary. Find a bathroom and kitchen designers and renovator on Houzz. Narrow your search in the Find Pros section of the website to bathroom and kitchen designers in Edmonton, AB. You may also look through photos of spaces to find kitchens or bathrooms you like, then contact the bathroom or kitchen designer who worked on it.